1. Alice had originally named Chez Panisse after a character in a Marcel Pagnol trilogy. Panisse is also a chickpea-based bread from the south of France. Literally sounds like "pain de Nice" or "bread of Nice." Worked out nice. 2. Chez Panisse is celebrating its 40th anniversary next year and Alice is currently working on a cookbook to commemorate it. 3. MUST visit Hollywood Farmer's Market SOON. It sounds like heaven. 4. Appreciate radishes more--they are delicious with salt (trés français) and are beautiful. 5. Need to invest in a giant stone mortar and pestle to make young fava bean purée or simply some pesto. 6. Always toss a salad with your bare hands. 7. Will only use kosher salt from here on out. Ina Garten apparently wasn't reason enough for me. It takes Alice Waters to convince me kosher salt is the way to go. None of that "powdery" iodized salt will do anymore. 8. When cooking outdoors, sport a pink parasol. Cute and functional. Gosh I love that woman. When I was a kid, my mom and I would always eat "radish sandwiches" which were just thin slices of bread topped with a little bit of butter, a lot of radishes and salt. And I also recently switched to kosher salt. I'm not sure why I don't before either. Mmmm, perfection. And I've definitely contemplated just stealing my mom's stone mortar and pestle out of her kitchen but I think she'd be a tad upset. I'm so glad you got to see her! How lucky! This is the first year I missed all of Festival of Books :( due to homework. i can't believe i just discovered your blog! i will definitely be visiting more often =). i used to go to the festival of books every year when I went to UCLA but since graduating it somehow has become harder to make it. Looks like a great time! Not convinced by kosher salt, sea salt OTOH... rocks. I find it hilarious she used a Japanese paper kasa... That BETTER be made in Berkeley and not China. @Jon: It's too bad you missed it! 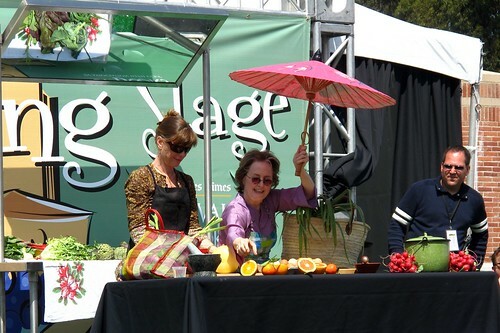 They were some awesome cooking stage events this year. @LetMeEatCake Eat With Me! : Thanks for stopping by! I can't believe I've never stumbled across your blog either. There's so many out there!